Wailua Falls are one of the two drive-up waterfalls in Kauai (Opaeka'a Falls are the second one). 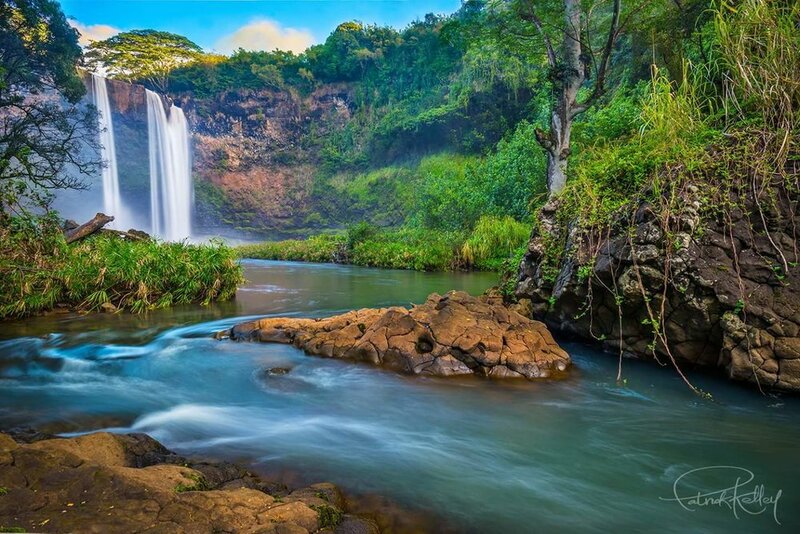 Wailua Falls were featured in the opening scene of the TV show 'Fantasy Island'. They are about 85 ft. high and drop into a pool which is about 30 ft. deep. I first saw them from the Jack Harter doors-off helicopter tour that I took of the island. The second time I actually hiked to the falls with my guide and friend, Patrick Kelley (www.pk-worldwide.com). 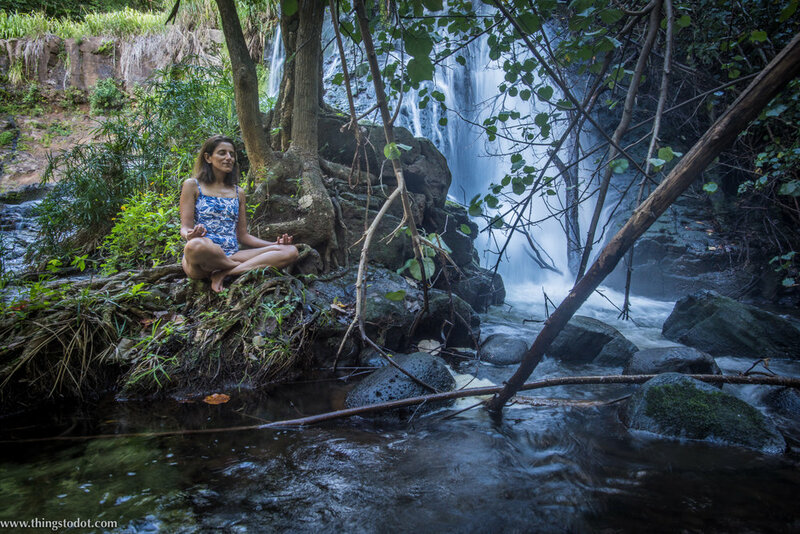 We left the hotel (Hilton Garden Inn, Kapaa, where I was staying), around 3 p.m. in the afternoon and after a short drive, arrived at the waterfalls that are located near Lihue. Patrick has been living in Kauai for several years and has done the Wailua Falls Trail several times. Spraying ourselves with anti-bug spray, we hiked down to the base of the waterfalls in about 20 minutes. The downhill hike is steep and can be challenging especially in rainy weather when the ground gets really muddy. Locals have hung ropes to help you hike down. You must take care to dress appropriately and wear good walking shoes. I managed the hike well in my shorts and Crocs water shoes. I was only carrying a cross-body bag that allowed me to keep my hands free. We didn't actually stay at the main Wailua Falls as it was a bit crowded for us. We hiked down for another 10 minutes to reach another waterfall where we spent our evening. There is also a natural pool there where one can swim. 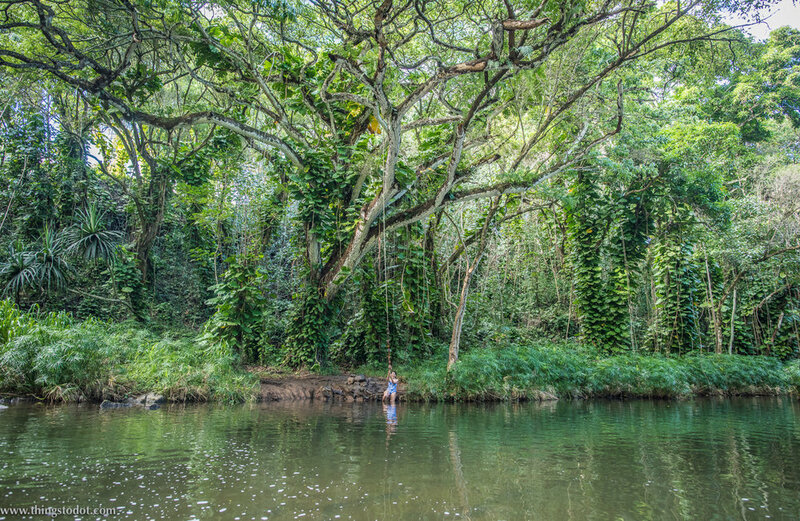 A must-do is to jump in the pool with a rope tied to a tree! I really enjoyed this second waterfall and swimming in the natural pool. If you get to the Wailua Falls, I highly recommend to climb further down to this second waterfall! Read my post on Hike to the base of the Wailua Falls/Wailua Falls Trail.